Welcome to the wireless generation, where bandwidth is critical, customer expectations are high, pricing is under pressure, and protocols are proliferating. In this fast-changing world, service providers are challenged with migrating to the wireless Internet, increasing capacity and maximizing their coverage. Simply put, AirNet offers wireless service providers the most compelling value proposition in the industry: a uniquely efficient path to the future that actually reduces operating costs as it provides operators with higher capacity and a migration path to the wireless Internet. System integration services including RF planning and network design, program management, installation and commissioning. AirNet. GSM Networks. System Integration. We've Got Wireless Covered. 2006 GSM World Award Winner for Best Radio Access Product or Innovation and 1998 winner for Best Technical Innovation - visit the GSM Association Web Site for the whole story. Florida Trend's Top 250 Public Companies - visit the Florida Trend Web Site for the whole story. The stylized AirNet mark, AirNet®, AirSite®, and AdaptaCell® are registered with the U.S. Patent and Trademark Office. Super Capacity, Backhaul Free, and RapidCell are trademarks of AirNet Communications Corporation. Other brands and marks are the property of their respective owners. Specifications subject to change without notice. ©1999-2010 AirNet Communications Corporation. All rights reserved. 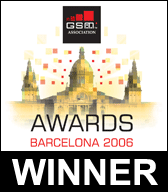 Adaptive Array technology deployed at MBO Wireless and in large operator field trial recognized as Best Radio Access Product for 2006 in Barcelona. A Mobile Cellular Base Station from AirNet Communications Corp. with 150 cellular phones from Cingular programmed to be compatible with the station is operational and being used by disaster relief personnel.